Presidential Control of Nuclear Weapons: The "Football"
In order to learn more about this crucial era, many years ago the Archive began spearheading an effort to get specific relevant documents declassified. In the summer of 2012, files began trickling in, first from the State Department and then from the Clinton Library, largely in response to itemized requests for specific summit meeting materials made by Archive staff (Svetlana Savranskaya and Tom Blanton) as well as by James Goldgeier with the assistance of Catherine Nielsen. These initial, limited declassifications gave us an important first glimpse behind the scenes of Clinton-Yeltsin conversations, including at the Cologne summit of 1999. 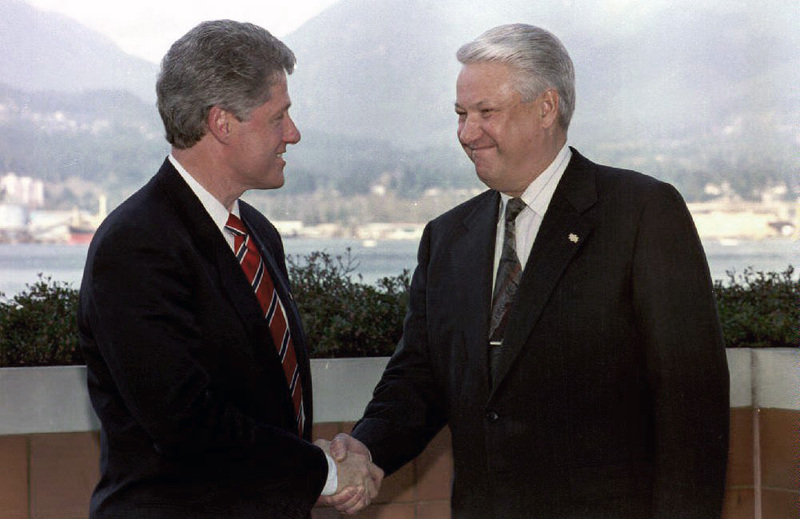 Another group of requests produced two particularly significant Clinton-Yeltsin conversations, in Moscow and Halifax in 1995, at the crucial point just before both men’s make-or-break reelection bids of 1996. Starting in the spring of 2015, Mary Sarotte decided to invest time in a broad-brush approach. She began a three-year process of compiling and filing omnibus requests to the Clinton Library and, when those did not succeed, pursued numerous appeals with the Interagency Security Classification Appeals Panel or ISCAP. She finally won some of those appeals in 2018, and the Clinton Library declassified a phenomenal set of memcons and telcons as a result. Even better, the Clinton Library declassified nearly all of the pages of her massive requests with no redactions. It therefore becomes possible to read almost the entire history of top-level U.S.-Russian interactions in the contemporaneous words of Clinton and Yeltsin in one (admittedly very long) sitting. Two archivists at the Clinton Library who worked closely with the Archive and Sarotte over the years – Rob Seibert and Kelly Hendren – along with Meredith Wagner of ISCAP deserve enormous credit for their hard work, which has provided students of history and diplomacy with a major scholarly opportunity. What do these new sources tell us? The selection of documents below, chosen both from the earlier requests and the 2018 Sarotte release, sheds new light on the most important issues in U.S.-Russian relations in the 1990s. They show Clinton as an empathetic and committed champion of the new Russia, willing to use his political capital to help his friend Boris in tough times, such as during the Russian constitutional crisis of 1993, or the close-run presidential election of 1996. However, the documents show that Clinton understood the need to balance his relationship with Yeltsin against other priorities of US foreign policy. While Clinton’s stated top goal was to help Russia become a democratic country – one fully integrated into the Western institutions – that goal often clashed with other U.S. interests. These interests included: expanding NATO to secure its presence and role in Europe and to expand democracy and security to East-Central Europe; denuclearizing the former Soviet space and making sure that Russian weapons of mass destruction were securely dismantled; limiting Russia’s role in its “near abroad”; stopping Russian trade in nuclear technologies with Iran and India; and managing conflict in the former republic of Yugoslavia. 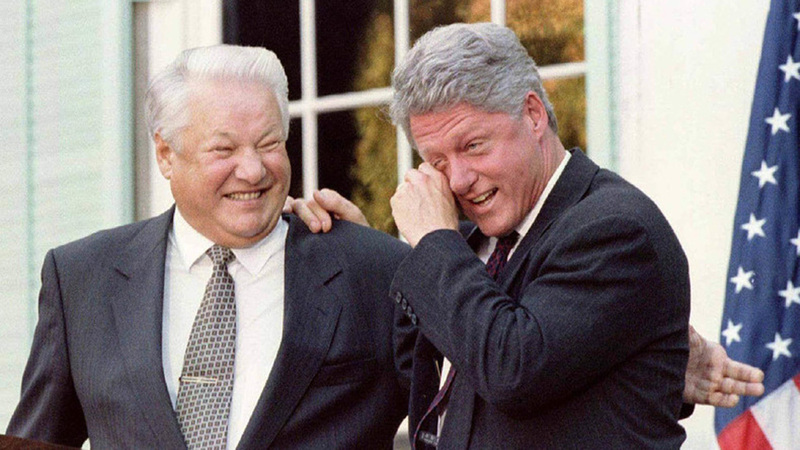 Clinton saw Yeltsin personally as an indispensable partner in achieving his goals. 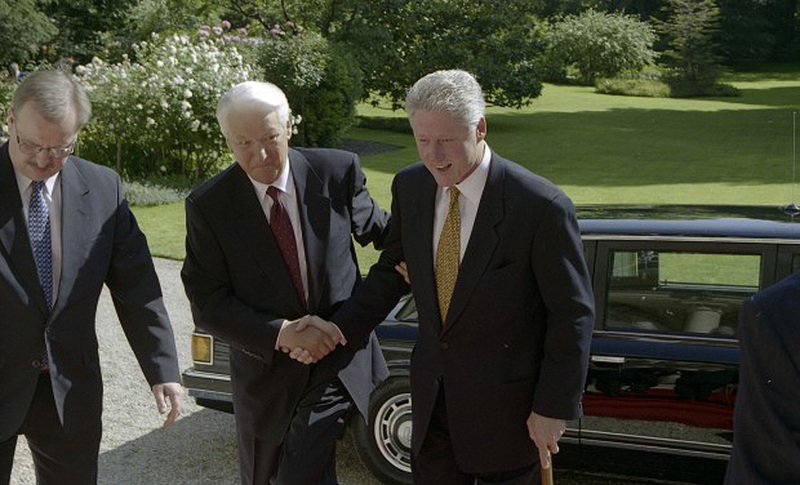 Only Yeltsin’s continued leadership, the White House believed, could guarantee Russian cooperation on U.S. priorities. The perception of Yeltsin as irreplaceable gradually led to the difficult situation where U.S. backing for the Russian democratic transition consisted largely of promoting its favorite “democrat,” Yeltsin, as the only game in town – even as he was quickly becoming an autocrat in reality. For his part, Yeltsin painted his opponents in the 1996 elections as the ultimate evil: unreformed communists who would attempt to reinstate Stalinism, and take back not only Crimea but also Alaska. 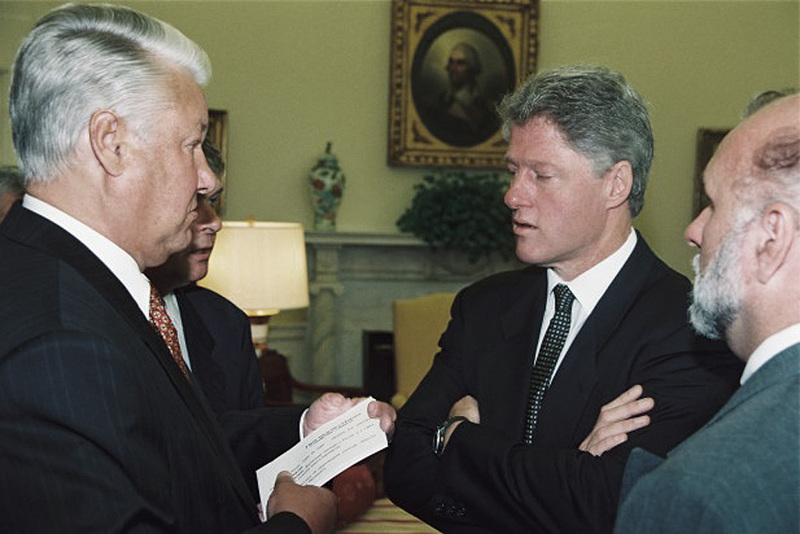 The newly available documents show that, in response, Clinton took many steps to increase the chances that Yeltsin would win the Russian elections of 1996, including making presidential visits, delaying visible progress on NATO expansion, and pressing Congress and international financial institutions to provide Russia with loans that would allow Yeltsin to pay salaries and pensions during the critical campaign period. For his part, Yeltsin openly asked his friend to provide $2.5 billion and complained that he only received $300 million of IMF loans. To ensure that Yeltsin survived, Clinton was willing to close his eyes to electoral irregularities, the rise of the oligarchs, the war in Chechnya, and the rising corruption in the new Russia. The administration’s policy essentially supported Russia’s economic liberalization as it developed into a form of robber-baron capitalism, or “market Bolshevism,” rather than developing into genuine democratic institutions and practices. Put bluntly, Russian stability and the implementation of the flawed market reform turned out to be more important in practical terms than the healthy development of Russian democracy. Tellingly, when Yeltsin reveals to Clinton in the fall of 1999 that he has chosen a successor – former KGB officer Vladimir Putin – and will do everything possible to get Putin elected as the next president of Russia, Clinton seemingly accepts Yeltsin’s choice as another one of the measures needed to guarantee Russian stability. This is not to say that Yeltsin was passive; he made significant proposals of his own, such as on European security structures, cuts to armaments, and even on getting rid of the “nuclear football” (the briefcase that always accompanied both leaders, allowing them to launch nuclear attacks at any time). Yeltsin genuinely tried to promote Russian interests. But he was doing so at a time when, simultaneously, Russia fell into steep economic and political decline and the U.S. rose to the heights of its “unipolar moment.” The interactions of these two world leaders at this crucial juncture – revealed in the documents below – have a legacy that shapes U.S.-Russian relations to this day. Yeltsin to Clinton on June 17, 1995 in Halifax (see Document 5 of this posting). Ronald D. Asmus, Opening NATO’s Door: How the Alliance Remade Itself for a New Era, (New York, 2002), 171. Svetlana Savranskaya and Tom Blanton, “NATO Expansion: What Yeltsin Heard,” National Security Archive Electronic briefing book. For more information about ISCAP, click here. See Peter Reddaway and Dmitry Glinsky, The Tragedy of Russia’s Reforms: Market Bolshevism against Democracy (Washington, D.C., The United States Institute of Peace, 2001). Clinton-Yeltsin memcon, May 10, 1995, Moscow. (see Document 4 of this posting).
. For a depiction of Yeltsin during the 1994 meetings and the “half-baked” proposals that he made during the first meeting, see Strobe Talbott, The Russia Hand: A Memoir of Presidential Diplomacy (New York: Random House, 2002), 134-137.
. Ibid., at 135-136, for the luncheon discussion of NATO.